^ Arment, Marco. "Apple has lost the functional high ground". Retrieved 15 August 2015. ^ "MacOS 10.13 High Sierra Announced, Release Date Set for Fall". OS X Daily. Archived from the original on 27 June 2017. Retrieved 6 June 2017. ^ Gurman, Masrk. "Apple Plans Combined iPhone, iPad & Mac Apps to Create One User Experience". Bloomberg. Retrieved 2 February 2019. ^ Steinberger, Peter. "Marzipan: Porting iOS Apps to the Mac". PSPDFKit. Retrieved 2 February 2019. ^ Gartenberg, Chaim; Bohn, Dieter. "The future of the Mac comes from iOS apps". The Verge. Retrieved 29 January 2019. ^ Ritchie, Rene. "Marzipan: What you need to know about iOS apps on the Mac". 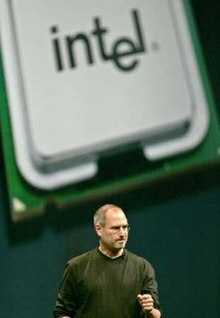 iMore. Retrieved 29 January 2019. ^ Mayo, Benjamin. "Marzipan". benjaminmayo.co.uk. Retrieved 29 January 2019. ^ Taub, Eric. "Apple sues Psystar to block Macintosh clones". NYTimes.com. New York Times. Retrieved 1 August 2015. 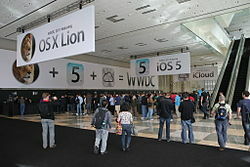 ^ "Apple Announces Future Macintosh Operating System (OS) Strategy and Road Map". Apple.com. Apple Computer, Inc. 7 January 1997. Archived from the original on 16 January 1999. Retrieved 18 September 2018. 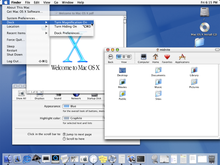 ^ "Apple Releases Mac OS X Developer Preview 4 with Final API Specs". Apple Newsroom. Retrieved 2018-09-18. ^ "Apple's Mac OS X to Ship on March 24". Apple Newsroom. Retrieved 2018-09-17. ^ Williams, Justin (2008-03-11). 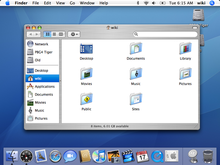 Getting StartED with Mac OS X Leopard. Apress. ISBN 9781430205197. ^ Cheeseman, Bill (2010-04-26). Cocoa Recipes for Mac OS X. Pearson Education. ISBN 9780321702883.